Despite claims otherwise, people still see homemade pizza as time-consuming and tedious. Nothing can be further from the truth. It’s easy, it’s delicious and it’s a skill that can win friends and influence people. For those of you who are converted, you might find what I’m about to post as blasphemous: a no-rise pizza dough. Yes, this dough requires no waiting around, no kneading…just mix it, press it and bake it. This really is the easiest pizza dough to make in the whole world. Nearly as easy as picking up already baked & bland pizza crusts from the grocery store and almost as easy as picking up the phone and dialing for take-out. This is a must-try pizza dough. I make it often and I top it with whatever I’ve got around the kitchen. It has never failed me and the recipe is so simple, I can quote it from memory. On nights when I just want to flop into a couch and order in some take-out, I know I can do better. It helps that I live in Vancouver where restaurant/take-out pizza is a disaster served in a cardboard box. I can make something way better than the expensive, tasteless stuff that gets delivered to my door. This crust is perfect for busy weeknights when you want an easy meal that will make everyone happy. What can I say, it’s a crowd-pleaser and it tastes great. 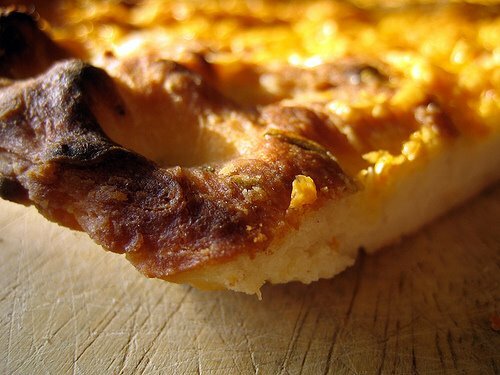 The first time I made this dough, I just created a simple pizza blanco….herbs, cheese, olive oil. I wanted to taste the crust and see if it was up to par. It was. Try it out like I did or make a pizza with your favorite toppings. Preheat oven to 400. In a large bowl, add in the yeast and warm water and stir until the yeast dissolves. Add the flour, salt, honey, rosemary (if using), and olive oil and stir with a wooden spoon vigorously until combined. Let dough rest for 10 minutes. Sprinkle cornmeal onto a walled baking sheet and press dough into it until thin. Spread olive oil over top, sprinkle with grated cheese and scatter a light sprinkle of fleur du sel over top. 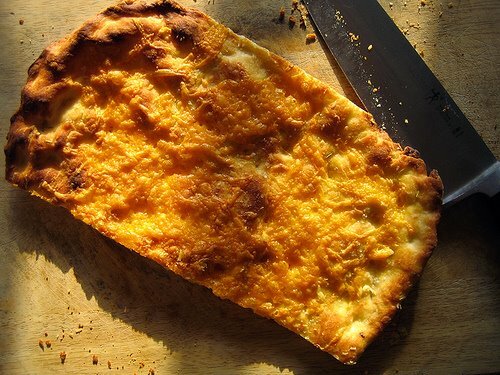 Bake for 20-25 minutes until pizza crust is golden and cheese is bubbly. a perk of living in nyc is being able to go into neighborhood pizzerias and buy pizza dough to use at home. that's truly the EASIEST way for people like me. haha. looking forward to trying it. I assume it's regular yeast like most pizza doughs, instead of quick-rise? thanks! crystal, you can buy pizza dough ready to go from bakeries & pizza shops here as well, but i live in chinatown! no pizza here!! this is way easier. laurabucci, i think the yeast is here for taste. it really tastes like regular pizza dough, nice and yeasty. i used to buy that dough as well, but this is much easier to roll out! yes, regular yeast is used here! thanks. Ooooh, I have the stuff for this one!! My girls would eat it "as is" but my guys would have to have some pepperoni(turkey) and maybe olives. The 16-year-old asked for pizza tonight in fact. Maybe tomorrow. My crust recipe is similar but I let it rest longer. AWESOME! This sounds quite similar to my "go to" dough but without the tedious wait. So psyched to try this but since I will be without an oven for the next few weeks I think that I may try it on the grill. OMG, I love this. I don't make pizza nearly as often as I should because of the rising time. It's just hard to time it all just right. The takeout pizza we have in Seattle is laughable so I am going on a pizza making mission! This is almost the same recipe as what I use but I let mine rise for an hour. Mine also has sugar instead of honey. Do you know, does honey proof the yeast like sugar? I'm wondering if secretly I've been waiting for my dough to rise all these years in vain! This looks very delicious! Even though I live in ny, I love to make my own pizza dough. The addition of rosemary is so smart. This is exactly what I've been looking for! The rising and all of the preplanning (timewise) for pizza dough was always what kept me from making my own. I can't wait to try this! Molly, sounds like the makings of a perfect pizza night! You can let this dough sit longer, but I actually like it better when it's used right away. Eviedee, I'd love to try this on the grill! You should try it out! Well, Dana, then this is the perfect pizza for you. I love it and I'm sure you will as well. Lili, honey does work the same way as sugar (you could even use agave syrup to make it vegan). Try this out, the dough has a slightly different texture/flavour but I really do love it. Thanks Joanne, I love the addition of rosemary! Pravina, I hope you'll like this dough. It's super easy and I think it's the perfect introduction to making dough. Maggie I'm shocked that you've never made pizza dough before! Freya, my packet says 8 grams. It's just the traditional yeast that comes in a 3 pack. Thanks for stopping by kblogs, sorry I don't do link exchanges. Lydia, skip the Whole Foods dough, can it be that great? I doubt it. This one is very easy, but I'm also a fan of traditionally raised dough as well. Normally, I tend to buy ready made dough but once in a while I do take the time to make my own dough. I have had so-so results with making my own dough. I find that I get impatient with the stretching part and just throw the dough into a pizza pan sooner than I should. The good thing about making your own pizza dough is that it is so forgiving…holes appear and then they disappear, irregular shaped pizzas are not a bad thing either because once it all puffs up in the oven and the smell of fresh baked dough wafts through the house…the only thing I'm thinking is…to get it in my stomach 🙂 Your blanco pizza sounds delicious and easy! How much does a packet of yeast weight? Sounds delicious, am definitely going to try it this week. I love homemade pizza but I have always had to plan way ahead to get the dough ready on time (pizza seems like such an impulse food). The funny thing is that I was seriously planning to go to Whole Foods today to try their pizza dough. But maybe I shouldn't now? 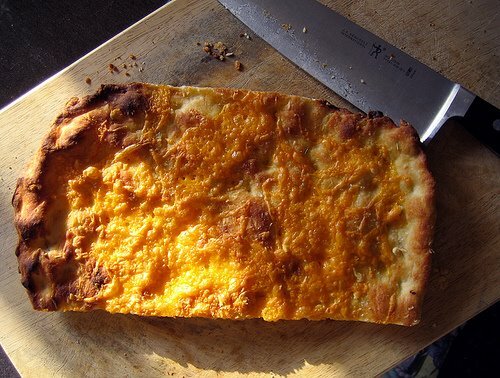 Whether I do or not, this recipe is in the queue and I'm making calzones tonight either way. Ok, that sounds SOOOOOOOOOOOO yummy! I'm gonna have to try that! I must admit I am /was one of those people who think making thier own pizza dough is best saved for special occasions where one has a lot if time….but I am determined to give your no-rise pizza bianco a try. I'll let you know… Grazie! I am totally going to make this tomorrow, with leftover lamb salami from Oyama Sausage, lots of fresh basil, and too many sundried tomatoes. Sounds fantastic, and I like that it's almost instant. My pizza dough is a three-hour process … not so good for weeknights. I've tried it! And it was great! I did mine with white flour and spelt. My topping was crotonese cheese, red onion, morrocan olives! It was awesome and super easy! another awesome recipe, thank you! just wanted to let you know, that my mother-in-law turned me onto your blog last year, and i read it often. it actually inspired my husband and i to start our own local food blog (we also review restaurants and give local purveyor information). so, a big thank you! I have heard of such things before…my husband and I have a pizza-making ritual down to a science (with rising dough) but this would make it even easier. Thanks! Really enjoy your blog and this sounds like a fool proof recipe (I might even try it!) But I was curious to see what you thoughts about using whole wheat flour or doing a combo? Oh gosh, I am so sold on this. Pizza it is! Thanks for this recipe. I love to make pizza, but it seems like a big production with 2 small children. I tried it last night and it is brilliant! I did figure out that a packet of yeast = 2 1/4 tsp. I will try to sub some type of wheat flour next time. I did not do the bianco . . . used red sauce, Italian soysage and sauteed banana peppers. It was delicious and was prepared in the amount of time it takes to have a pizza delivered. Emily, I'm sure this would be great on the grill…with pesto. Yum! Bijoux, this is so easy, I'm sure you'll love it. No waiting. And it is really, really tasty. Try it. Hag, no special occasion needed. I make this when there's nothing in the house. It's the perfect, make it and eat it food. Almost like fast food for your kitchen. It's awesome. I hope you give this a try, emvandee. It's as close to instant as well, instant! Laura, so glad you loved it! Glad it worked well with spelt flour too. I hope you try it out, eatme! Leftoverist, this is not science. This is just ease. Hope you try it. Thanks, lcgrant03. I'm actually not so much a fan of ww flour in pizza dough. I would do half and half, as I think all whole wheat would be too heavy. Experiment! Do I hear potato pizza, Daily Spud? Angela, so glad it was so easy for you. Your toppings sound wonderful. Hooray for weeknight easy cooking! I was surprised that this recipe didn't even call for instant yeast. I'll have to try this the next time I'm too pressed for time to make my usual dough. You're so right – you can do much, much better than delivery (or, shudders, frozen) pizza. I'm intrigued. Just made regular pizza tonight. Wish I would have read this post earlier. I'll definitely give this a try. Tokyo has great super thin crust pizza but is lacking in thicker crust pizza. I am not much of a baker… but I am guessing that you can't substitute whole wheat flour for white flour in this recipe (which I did)…also does it matter if I had a packet of fast-acting yeast? My pizza didn't turn out very good 🙁 …. also how thin do you spread it? Lynn, I never use quick yeast, just the regular old stuff. Works great! Hag, I would never make an all whole wheat crust…they usually are all awful. Half white and half ww should be okay (but I never tried it with this recipe). I also just use regular yeast, not the quick stuff. Too bad it sucked! But if you make it with white flour & regular yeast, it will be good. Trust me! Hmm…maybe this will help me get over my fear of baking with yeast! Hmmm….I'll have to give this a try. I've been looking for a good pizza dough recipe. Gorgeous crust, with blistering and all! Well done. wow, i must try this! Mrs L, get over it! This is the easiest yeast recipe…it works just like another ingredient. Nothing to be scared of. Fiber, this is an easy no-nonsense recipe. Soon, I hope you try this out. I think it's pretty perfect. I just made homemade pizza the other day. I love it, it is so therapeutic! Your pizza looks delicious! I've made pizza a dozen times or so with different dough recipes and this one beats all of the others! No rise time (although I let mine rest a bit longer than yours) and you have a perfect base for a really excellent pizza. I did sausage, cherry tomatoes, zucchini and dried basil and oregano. I just made this for dinner and it was amazing. I stuck to your example, but just added more fresh herbs over the cheese, and instead of the fleur de sel used C Restaurant's smoked sea salt. So delicious! Thanks Sarena, I don't know if this recipe is all that therapeutic, since it's all over so quickly, but I appreciate the sentiment. Mentos, so glad you enjoyed it! Yay Wendy! Glad you loved it. That smoked sea salt sounds amazing. DISASTER!!! :-/ I tried this tonight and the dough stuck really hard to the pan, so much we couldn't get any of it out!! I scraped out the topping (delicious: tomato sauce, sausage, grilled peppers, cheese, pine nuts) and filled tortillas with it. Iris, I just sprinkle cornmeal and I've never had a problem with it sticking. If you don't use cornmeal, then yes, by all means, oil up the pan. Sorry it didn't turn out for you! Iris, I use enough to cover the bottom of a cookie sheet…maybe 1/4 c worth? this is the best and easiest dough ever to make…just wanted to thank you for posting it. we've also used this recipe for BBQ pizza so good, it crisps up nice and thin on the grill. so thank you again. I made the dough last week, it was a huge hit with my little one and hubby too. This from a guy that worked at a pizza joint too. For toppings I used tomato sauce, and mozzarella. I made this for dinner tonight and it turned out great! I love your blog and look forward to more of your recipes. Your oven temp is off. 25 min at 400F will result in ashes. Rachel so glad you loved it! Anon, sorry, that is the temp I've used and I've made this recipe many, many times. That said, I don't have an oven thermometer and my oven is really old, so that may be off a little. i just made this pizza dough, left out the rosemary, and used half spelt flour and half all purpose. it was FANTASTIC! and ridiculously easy. this is definitely going on a notecard. thanks so much for posting it. Excellent! Certainly the best I've ever had in under an hour ^_^ It was a bit dry on my first round, but this time I threw on some ricotta, moz & basil. I crushed a few cloves of garlic into the dough first, and it made a winner. Thankyou! I tried your recipe. It was really good. I added pesto sauce as well. May I publish your recipe on my site with proper acknowledgments of course. FINALLY tried this last night and it’s SOOO Much better than any pizza dough i’ve gotten from a Brooklyn pizza joint. And I was able to use up my leftover frozen rosemary (from 2 years ago!) and it really was the easiest thing ever. Especially versus haggling with the pizza guys that last time I paid $3 for the same dough they’re trying to charge me $5 for now…. p.s. I didn’t have cornmeal but I just gave the pan a generous spraying of PAM and it didn’t stick at all. FINALLY tried this recipe tonight since I had edited sooooo late that I couldn’t even order a pizza and was super hungry. While it was not *quite* as yummy as my usual dough I think that your recipe is my new favorite as it requires zero planning ahead and is super delicious! I had a sausage, onion, olive, and pepper pizza thrown together in no time and was able to get to the very important task of vegging out in front of the tv quickly. Thanks for saving the day! Hi Emma, the packets of yeast here in Canada are 8grams (about 1.5 tablespoons). T is just my shorthand for tablespoon. A small t is my shorthand for teaspoon. One cup is 8oz. Hope that helps! Because the dough does not have to rest very long, we have enjoyed making bunches of different pizzas with friends and family. We stand around the table/counter and just grab whavever we have on hand. It all seems to go very well. The time spent making pizzas and hanging out waiting for the next one has made for some very memorable and enjoyable evenings together. I made this quick pizza dough for my family tonight. It was sooo easy & delicious. I threw everything in my Kitchen Aid with the dough attachment and it was ready in a just a few minutes. I made a ham & fresh pineapple and a veggie….both with Trader Joe’s Marinara sauce. This is by far the easiest, and tastiest pizza dough I’ve ever come across. I let it knead on the lowest setting for 5 minutes, and sit for 10. Easy Peasy! Can this dough sit over night? Yes, Haley, you can let the dough sit in the fridge overnight. I don’t think it improves the flavour by much, though! I wanted to let you know that this is my go-to recipe for pizza dough. It is so easy, and I love that it doesn’t really matter how long or short I let it sit before spreading it out. I have used it many, many times over the last few years. Merci beaucoup! Holy cow, look at all the comments!! This dough is a lovely tender little dough that goes together in no time! I’ve been cooking/baking for 25+ years and never made pizza somehow. This is a great starter recipe for someone who shies away from yeast doughs. And my sons and husband loved it. There are very few meals whom everyone at the table enjoys so this is a keeper. Thanks, Kickpleat! holy gheeze! just wanted to say thank you so much for this recipe. i have been making this weekly for a long time and it hasn’t failed me yet. anytime i think of dialing for subpar delivery i think … get your bum off the couch and spend 10 minutes making this AND it is always super yummy. i have likely saved hundreds of dollars from this recipe – thank you thank you! Ann, thank you!! Hooray for doing it for yourself and I’m glad this recipe helped save you a few bucks from take out!